This is actually a term that people are quite confused with, as the term ”Pontoon” also refers to a flotation device, at least according to wikipedia. However, the Pontoon we are about to review in this article is a casino card game that is very similar to BlackJack. It’s actually an unlicensed variation of Spanish 21. It’s a very popular form, hence offered at almost all online casinos, including ones powered PlayTech, Cryptologic, MicroGaming, and Net Entertainment, simply the best online gambling companies in the world. Highest hand in the game is ”Pontoon”, which consists of a face card and an ace. Dealer hits until he has at least 17 and also hits on soft 17. Players have all the same options available, they are worded differently though. Twist (Hit), Stick (Stand), Buy (double) and Split are all there. Okay, so back to the main point – what’s different in this game compared to one that you might be already used to. A natural hand pays at 2 to 1 odds, in comparision it’s 3 to 2 payout in most BlackJack Games. Dealer wins all ties – there are no pushes in the game. You can take as many cards, after doubling, as you wish. There’s an added payout for a winning combination that consists of any 5 cards. If you didn’t bust in the hand and won it, a 2 to 1 payout will be awarded. Dealer does not show his cards until you are done with drawing cards to any of your own hands. The only exception to this is when he has a natural hand aka ”Pontoon” himself. As I already mentioned, this game is widely spread across the whole online gambling scene. This greatly benefits you and any other potential players, as you’ll be able to find it at most casino sites. Lets take a peak at the best ones, though. Experience everything this game has to give at Jackpot City Casino. Powered by Microgaming software, this casino is among the industry oldtimers and has been around for almost a decade. 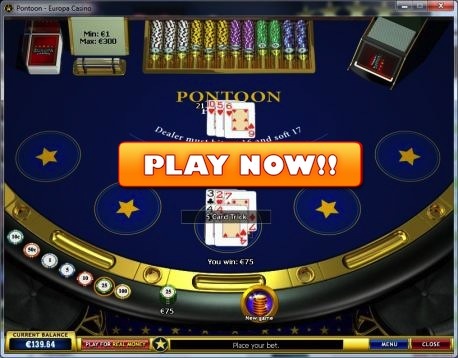 You can play by using the instant, flash based casino or alternatively download it on your computer. Join Now – $/€/£ 500 Welcome Bonus! I would suggest to choose Inter Casino – another industry veteran. They actually celebrated their 13th birthday and the same amount of consecutive years that have been successful. If there’s a brand I strongly believe to be in the list of top 3 casinos, it’s InterCasino for sure. They are powered by Cryptologic and offer around 100 casino games, including Pontoon. Join now and you’ll be welcomed with a 100% match bonus, up to $/£/€ 500. This goes along with their loyalty bonus program, known as ”Bonus 4 Life” which does mean exactly that – constant flow of bonuses for life or as long as you play!